The issue opens with “All Aces Battle Royale” which is a Star Wars Resistance tie-in story. 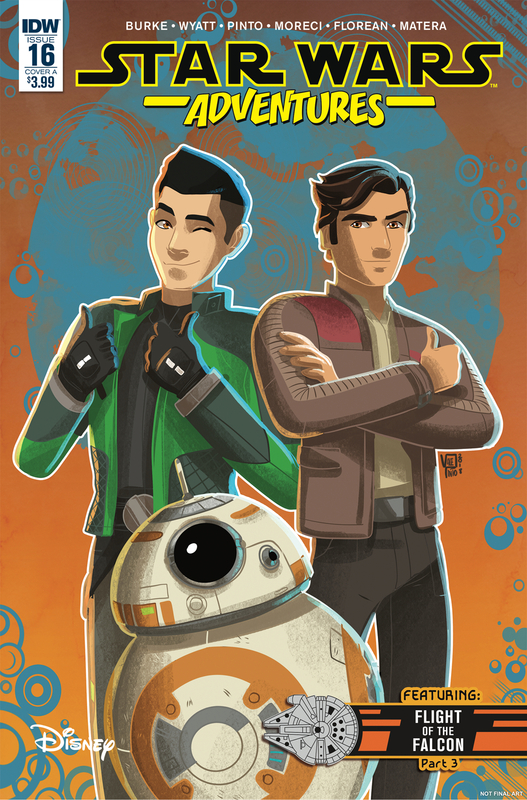 It stars Kaz and BB-8 as they enter a race to steal some info from a First Order informant who happens to be a racer. There’s action, hijinks, and they end up getting the intel. The artwork is interesting as it’s a different style. Cartoony, but with detail and soft shading effects. It’s different from the style on the animated show, but everyone is still recognizable. It actually looks like something you might see as illustrations in a kids book. The second story is “Home Again” which is part 3 of the Flight of the Falcon storyline. Bazine is still chasing down the Millennium Falcon and now she’s paying the bounty hunter Embo of intel. Like all of the other stories, this leads to a flashback story with Embo crossing paths with Lando and Nien Nunb. The interesting thing is the Falcon itself is the one to defeat Embo. And like all the other stories, it doesn’t actually help Bazine on her quest, but Embo offers some additional info on another lead. It’s not an essential story by any means, but I have to admit, I really like seeing Embo. And the artwork in this story is outstanding. I love the style. Both stories are fun with nice artwork. As an adult, I did enjoy them, but you don’t have to run out to the store and get this one. That said, it might be worth checking out eventually when you get the chance. I give it a four out of five baby nexus.